The Trustbadge® technology enables you to easily collect, manage, and show customer reviews in your Shopware shop. Once integrated, it updates automatically. You can also integrate the trustmark and offer your customers the money-back guarantee. As a Shopware user, you can get the Trusted Shops extension free of charge here. The extension is compatible with Shopware version 4.2 or higher. Please install the extension. Notice: If you are using an older version of the extension or you have already integrated the Trustbadge manually, please deactivate it or remove the integration before proceeding. 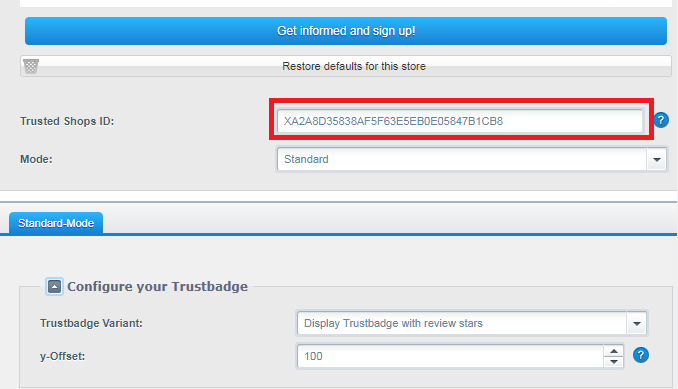 Log in to the backend of your Shopware shop and bring up the configuration menu at Marketing >> Trusted Shops Trustbadge. Enter your Trusted Shops ID (starting with X) and save. You can find your Trusted Shops ID in your My Trusted Shops account or in your welcome e-mail. You can also choose whether you want to display the Trustbadge without the star ratings (variant) or set a margin from the bottom right of your shop (Y offset). You’re already done! You’ve successfully integrated the Trustbadge®. 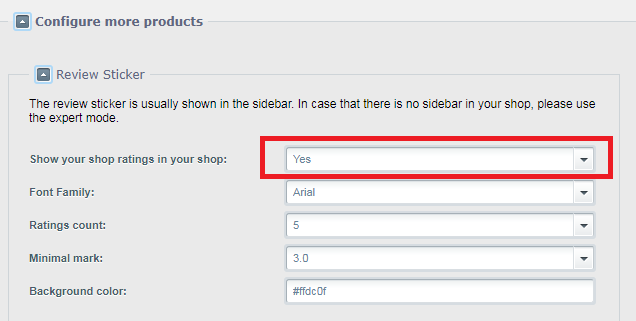 You can now test the functioning of your Trustbadge® by triggering a test order in your shop. Make sure that the trustcard appears at the end of the ordering process. The trustcard contains a button your customers can click on if they want to receive a review request. If you want to use Trusted Shops product reviews, you can activate and configure them in your product description. You can adapt the way you want product reviews to be displayed in the layout of your shop by setting further parameters. You can define the colour of the frame surrounding the reviews as well as the colour and dimension of the stars. If you want to show the reviews in a sticker in addition to the Trustbadge, you can use the Review Sticker. 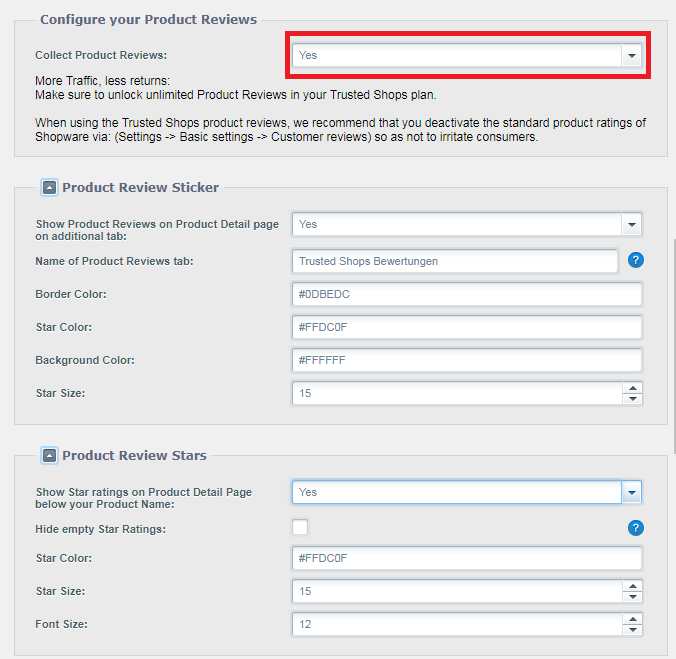 Activate the option “Review Sticker” at “Configure other products”. If you activate the rich snippets, they will be integrated into the pages you’ve selected, which may lead to your stars being shown in Google organic search results. If you have already activated shop or product reviews separately in their standard modus, the rich snippets are already being transmitted. We recommend that you don’t also activate the rich snippets in the product category or product description page or that you deactivate them for the sticker in the expert mode. If you have fixed delivery times that don’t change according to the product ordered, you might want to customise the moment your review requests are sent out. Then please enter the average number of days after which your customers receive the ordered goods into the field “Standard delivery time”, so that we can send your customers a review reminder at the right time. In the field „Not in stock delivery time“, you can enter the average number of days needed to deliver a product that was out of stock when it was ordered. Please note: The review request sent to the customer can only be sent on this date if you have selected “Yes” for the option “Send on the expected delivery date” in your My Trusted Shops account at Reviews >> Settings >> Rate later as well as for the option “I would like to activate this feature” at Reviews >> Settings >> Collect reviews automatically. Otherwise, the Trusted Shops default settings will apply (you do not have to make any changes to the settings here). Do you want to display the Trustbadge on the bottom right or elsewhere in your shop? Do you want to deactivate the responsive display? Do you want to change the way product reviews are displayed? In “Expert” mode, you can further customise your integration by using additional options. Please replace “YOUR TSID” with the Trusted Shops ID of the shop that you want to collect reviews for. Please replace “YOUR TSID” with the Trusted Shops ID of the shop that you want to collect reviews for and set the number of days after which you want to send a review e-mail. Log in to your Shopware shop backend, bring up the corresponding feature at Inhalte >> Import/Export and select the orders you want to export. We recommend that you export the orders placed with your shop in the last 2-3 months. Download the CSV file and open it in a spreadsheet program (e.g. Microsoft Excel). Please create a new, empty file in your spreadsheet program in addition to the CSV file you’ve already opened. Copy and paste the columns email, ordernumber, shipping_firstname and shipping_lastname in this order in the new file. Delete the first line with the column header from the new file. Save the spreadsheet as .xls or .xlsx on your computer. Log in to My Trusted Shops. You will find the Review Collector in the menu Reviews. Follow the easy steps provided on the website, i.e. upload the spreadsheet you’ve just created, select a template for the e-mails, and send out the mailing. It won’t take long before you start receiving new reviews.